1.Top performing companies score high in allocating sales resources for each of their Customers such that an account management plan specic to the requirement of every individual Customer is in place. 2. Only 14% of all people in a company know its strategy, say studies. Top performers seem to overcome this risk by documenting their strategy, for consistency of communication. 3. A process is only as good as its implementation. Top performing companies don’t stop with dening sales processes and workows. They get better at supporting their people in living those processes by developing training modules, checklists and instruments for each step of the process. 5. 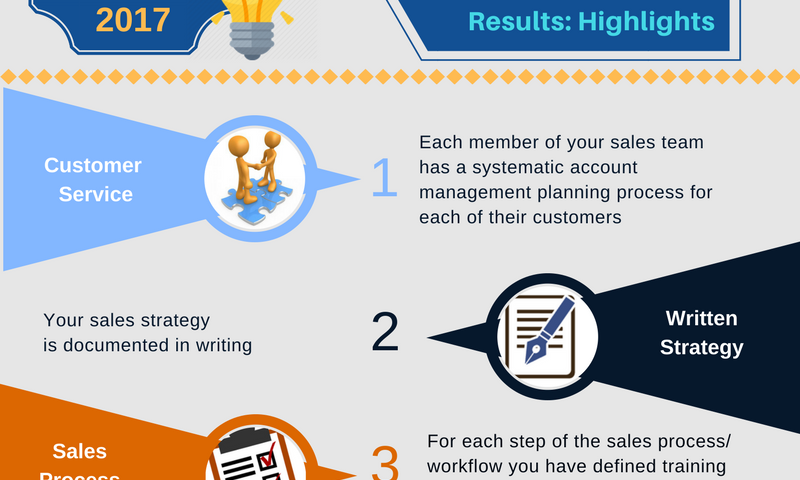 Flawless execution being the hallmark of good sales, Top performing companies attach a premium to documenting detailed descriptions of the sales processes and work ows. 6. Top performing companies are far ahead at elimination of silos enabling sales to initiate and adopt a cross functional approach with other teams, to address Customer requirements holistically. 7. At top performing companies, CRM serves to hardwire the whole organization to Customer centric approaches. These companies ensure their sales teams update the CRM regularly so as to stay in tune with Customer requirements in real time. 8. Top performing companies recognize the inherent need for achievement and gratication in the sales mindset. They hold Sales in high esteem. The intrinsic pride of belonging to such an environment in itself could be a powerful driver of performance for sales people. 9. Top performing companies leverage the potential of technology in supporting learning initiatives and appear to prefer an approach which blends class room training with virtual learning to develop sales competencies in their sales teams. Atrina Center, 32 Kifissias Ave.